In my opinion Customer Review Scores are likely to have the biggest impact of the much-flaunted Social Media revolution. Tripadvisor has long been the site of choice for a customer looking for hotel review scores and to fair it does a decent job. However, the commercialisation of this data is deliberately non-customer friendly, with customers forced to trawl through the 10’s of web sites, popped up by Tripadvisor in order to charge each supplier a referral fee. In the medium term this commercialisation may leave open the door for Google who are trying to penetrate the review sector. Ironically hotel review scores undermine a key skill set of the traditional tour operators. Historically, they have always been able to claim a higher quality of product, because their in-resort Reps and contractors can continuously monitor the quality of the product and have first hand knowledge of the hotels they sell. However, using consumer review scores web companies can now completely control the quality of what they sell, in order to offer a premium product, without ever leaving their computer terminal. Google’s move into the review space is also changing the landscape in terms of the importance of brand reviews and how they can influence marketing costs. Companies can now include their customer review star rating in their PPC adverts, which Google’s own research shows markedly increases the amount of clicks those adverts attract, improving CTR score’s and reducing advertising costs. Amazingly traditional tour operators like Thomson and Thomas Cook seem to have completely ignored this move to online reviews, having no scores next to their names and appear to be continuing with paper based customer review sheets completed on return flights. I think they will regret the lack of transparency in the publication of their customer’s reviews, since I still believe in general they offer a high quality product. Yet when you look on review sites such as Review Centre, Thomas Cook for example score a very poor 1.9 out of 5 from 442 reviews. To put this into context my own Holiday Nights brand scores of 4.8 out of 5. Are we that much better? I doubt it, but unlike traditional tour operators we are working hard on Social Media and ensure that every returning customer is emailed to ask them to post a review via Feefo that will be picked up and published by Google. Years ago, whilst at Airtours we did extensive customer research to look into why 90% of customers completing review sheets on the flight home, said they would recommend Airtours and book again, but only 40% ever did repeat book. The research showed that the “Holiday Halo”, where customers have a good holiday and feel favourably about a tour operator lasts for about 6 weeks and then fades fast as customers get sucked back into daily life and forget about their holiday. It was to maximise the chance of re-books on holiday return, that we started launching the next summers holiday brochures at the beginning of the current season. I believe that if you do not engage actively with your happy customers in this period, it’s likely the only ones bothered to make the effort to leave a review will be the ones who did not have a good time! I think Google’s move into brand reviews has given Social Media further bite, making customers views not only more visible, but commercial attractive as they can reduce advertising costs. Therefore, ignore this at your peril big guys, since Google and customer opinion is bigger than you. 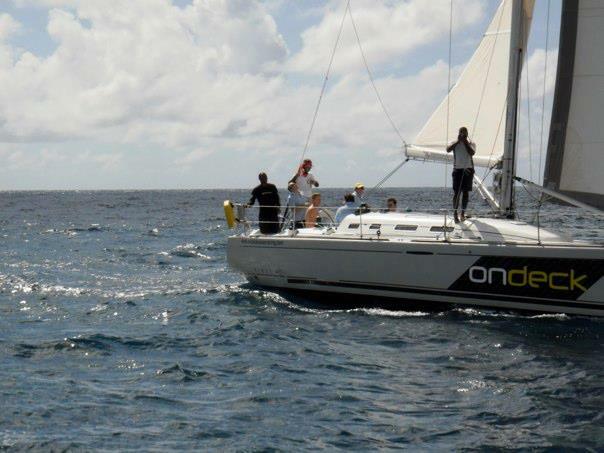 I was lucky enough to be in the Rock Insurance Party who won the inaugural Antigua sponsored sailing Regatta that took place in Southampton in September. Actually to be truthful I was too busy that day but once I found out that they had won the event and an all expenses trip to Antigua to go sailing for 3 days I pulled rank!! !